The postal carrier just brought me some copies of A Peanuts Halloween, the trick-or-treat minicomic. First, let me note that by minicomic, they don’t mean “pocket-sized”. This is 8.5″ high, 5.5″ wide — what small-press comics folks would call “digest sized”. It’s 16 pages, including covers. 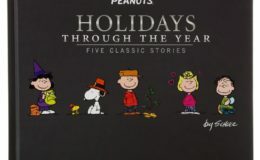 The back cover is an ad for The Complete Peanuts, but all of the interior pages are Peanuts comics, either a vertically-oriented Sundays (printed in color) or two dailies (black and white) on each page. And all of them are about the Great Pumpkin, of course! This will be a good thing to give out to the trick or treaters — and to keep a couple for myself, naturally!